The theme for this month’s Assistance Dog Blog Carnival is “Obstacles.” Lately it’s become very clear what my biggest obstacle is in training Barnum: me. Or, to be kinder and more accurate, my panoply of disabilities and their attendant symptoms. What I noticed as I read through the quotes (aside from the fact that, except for unknown authors, these were all said by successful white men) is that the underlying message to all of them is this: Obstacles aren’t real. 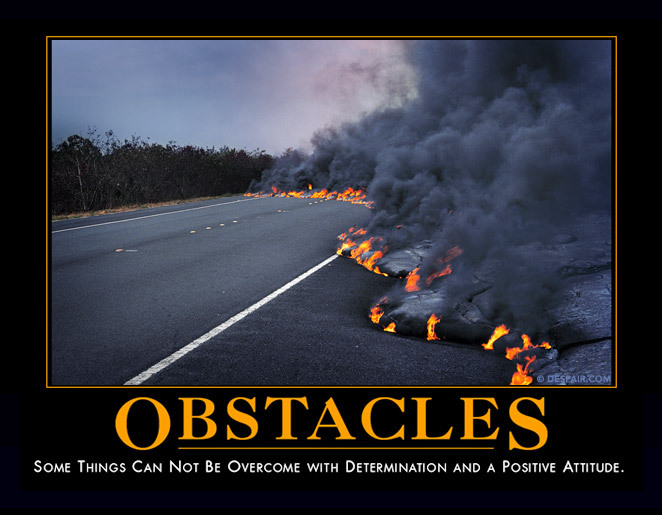 What you think is an obstacle is actually your personality defect. Get some perspective, little missy! Ditch the bad attitude and start thinking B-I-G! If you fail, it’s because you didn’t follow the dream recklessly/doggedly enough, and it’s your own damn fault. That’s the truth of it: If you’re “weak,” too bad for you. If you’re “strong,” you get all the cookies. (And by cookies, I mean, money, security, respect, freedom, independence, choices, opportunities, etc. In a nutshell, privilege.) Basically, “weak” can just be a stand-in for whatever misfortune or trait a person might have which puts them on the margin. Of course, “weak” can also literally mean “weak,” and that’s a reality for some of us, too. My biggest obstacles are not imaginary. They are not any sort of personal failing on my part or Barnum’s to be determined, smart, dedicated, hard-working, or creative enough. Because, in all honesty (but not modesty), I have all those traits. And they’re not enough. My severe pain and mondo-weirdo sleep disorders and exhaustion and inability to think clearly and inability to drive and inability to leave the house and inability to leave my bed and struggles to walk, talk, bathe, etc., all affect my training with Barnum in every possible way. It is so damn frustrating! I want a trained SD desperately. It’s true that I am training him to a higher standard — in terms of both the solidity and number of skills he’s learning — than I used with Gadget or Jersey. Nonetheless, I’m also a better trainer, and we’ve been working longer than I’ve ever worked to get a SD completely trained. I don’t want to just keep training forever! I want to spend time with Barnum working, playing, getting out and about, having fun, being free and independent. I want this so bad! And lately it has become so starkly apparent that the reason we are so behind in so many areas is not him; it’s me. When he started rounding the corner to two year’s old, a lot of dog maturity suddenly clicked into place. He has more energy. He catches on to ideas much faster. (I wrote recently about how we’re having more “light bulb moments.“) He’s more enthusiastic and confident. He wants to train. Indeed, he wants to interact with me all the freaking time! He’s insatiable! He’s turned into a training machine. This miracle I’d been hoping for of a dog who really wants to work, who chooses to be a service dog, is coming to pass. And much too much of the time, I’m so damn tired, I just want him to leave me be. I want peace and quiet and rest. plus doing ongoing work on go-to-mat, down-stay, sit-stay, zen/leave it/self-control, come, crate, quiet, separation anxiety, and other things I’m forgetting. Yes and no. Yes, we’re making progress. Nobody is more aware of that or more excited about it than I am — believe me! I’ve waited a long time to see this. There was a time I thought we were hopeless! I’ve tweeted and posted on our Facebook page, and on the Training Levels list, about how Barnum has really started to help me with some important skills, especially when I’m very sick. This is terribly exciting, and there have been a time or two I almost wept with gratitude and joy that we have achieved this place. I also tend to shower him with praise, hugs, and kisses when these events take place. What I’ve noticed the most, when I actually need help, and I ask him to do that thing, not just as a training exercise, but because it would really be damn useful, and he does it, it’s a totally different world we are entering. It’s the world of partnership, of a new level of communication, of moving from mommy/baby or teacher/student to something more like, well, partners. It’s really the word that sums it up best, because it’s appropriate in every nuance and meaning of the word — equals, mutual supports, working team members, family, beloved, etc. We are not there yet. Most of the skills above are still in their youth, if not their infancy, in some cases. Most of the time I’m still putting the energy out, out, out, and only sometimes is it coming back. By his second birthday, I really had expected him to be working full-time, with just polishing of a few skills. Instead, only a few of his skills are in working order, most of them are under construction, and a few haven’t even been introduced. So, yes, the reason we have achieved what we have, despite the immense obstacle of my illness, is due to our determination, smarts, dedication, hard work, and creativity. We certainly wouldn’t have gotten here without all that. But the fact remains that we still have so very far to go because the obstacle of my illness is real and cannot be “overcome” as in the endemic supercrip trope. We can only chip away at this block of granite a little bit at a time, sometimes with a pick-axe, and a chunk comes tumbling down, but mostly with a dull pocket knife, or a bent spoon, or sometimes just a toothpick or a thousand drops of water over the course of years that hollow out a smooth indentation where I rest. Waspish Wednesday: Please Don’t Comment on My Voice! This post cross-posted at ChronicBabe.com. Or, Behavior Modification (Training) Works on People, Too! 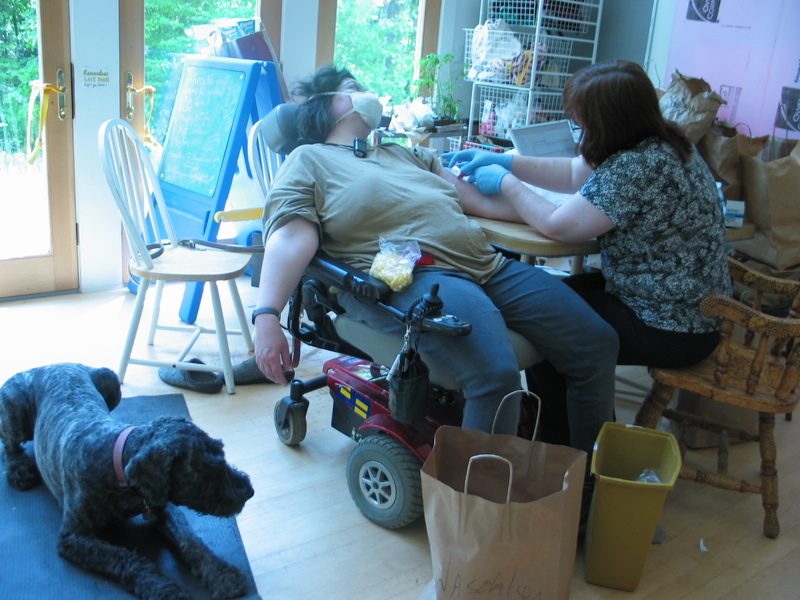 I’ve been disabled by chronic fatigue syndrome and multiple chemical sensitivity since 1995. However, when I became infected with Lyme disease and two other tick-borne diseases in 2007, I developed several new symptoms. One of the strangest and most difficult has been intermittent vocal cord apraxia, which means that sometimes I can’t make voluntary sounds, most notably speech. The amount of voice I have occurs on a spectrum from total inability to speak, to severely affected (like a cerebral palsy accent), to scratchy and hoarse (like laryngitis), to completely normal. Most of the time, my voice slowly improves over the course of a day: upon waking, I can’t make a peep, but by nightfall, I can talk a blue streak. Other times, it’s very sudden: at noon I can’t say a word, but by 1:00, I speak fluently. Conversely, I may be talking fine until a chemical exposure or an exertion (e.g., taking a bath) steals my voice in a flash. Frequently, when I can’t speak, it’s the sign of a “bad day,” when I’m also immobilized by severe pain and fatigue. However, there are times when I can’t voice, but I’m not feeling worse than normal — as well as days when I can speak, but I feel like hell. The response is usually a surprised and confused pause, followed by profuse apologies. I interrupt this, too, saying there’s no need to apologize, that they didn’t know, and that it’s just information I’d like them to have for the future. The best response is a “thank you for telling me.” This tells me they have not taken it personally. So far, this strategy is 100 percent effective; if I make this request, it is always honored. Everyone has their own preferences about whether, how much, or with whom they wish to discuss their health or functioning. I personally restrict such discussions to family, and close friends who are also disabled. I know I’m not alone in my struggle. Like others with disabilities, I’ve had people comment on, and try to judge the state of my health based on, my use or non-use of various assistive devices (wheelchair, oxygen, filter mask, service dog) or my behavior (standing, sending an email, writing a post, leaving the house). My advice to chronic babes who’d like others to ignore perceived clues to the vagaries of your condition? Tell them! My advice to those who I speak to on the phone or on the street? Ask about my dog training, writing, or opinion on the weather — just don’t mention my voice! *The exception to this are those who see me, day in and out, with and without voice, and are used to its vagaries, such as my partner, my personal care assistants, and a small number of friends who are also disabled.